When the Obama administration announced the official U.S. delegation to the 2014 Winter Olympics in Sochi, Russia last week, several prominent gay and lesbian athletes were named among its members. Although the administration did not mention the anti-gay laws enacted in Russia over the summer when naming the delegation, President Obama made clear at an end-of-the-year press conference that he was sending a message to Russia about American values. Obama and his administration had been viewed positively by LGBT Americans even before this most recent expression of support for LGBT rights: The Pew Research Center’s survey of 1,197 LGBT adults, conducted this spring, found that Obama enjoyed significantly higher favorability ratings among LGBT adults than the general public. And according to the national exit polls, lesbian, gay and bisexual voters supported Obama 76% to 22% over Mitt Romney in the 2012 election. The survey also found a widespread belief among LGBT adults that the Obama administration, and the Democratic Party, are generally supportive of LGBT people: 63% said the Obama administration was generally friendly toward lesbian, gay, bisexual and transgender people; while just 6% said the administration was generally unfriendly (30% said it was neutral). 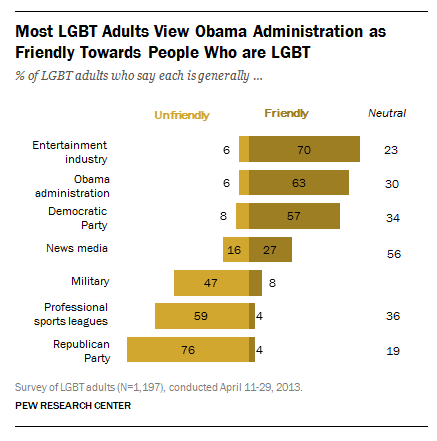 LGBT views of the administration track closely with views of the Democratic Party (57% friendly). By contrast, 76% of LGBT adults say the Republican Party is unfriendly toward lesbian, gay, bisexual and transgender people. 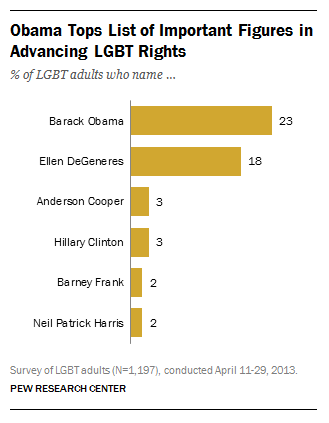 In the same survey, Obama was mentioned most frequently when respondents were asked to name national public figures most responsible for advancing LGBT rights: About a quarter (23%) of LGBT adults volunteered Obama. LGBT adults say public support for LGBT issues from non-LGBT leaders, and well-known public figures who are open about being LGBT, are significant factors in broadening social acceptance of people who are LGBT. About two-thirds of LGBT adults say each of these “helps a lot” in making society more accepting. Only personally knowing someone who is LGBT ranked as high. While the American public overall has become more accepting of homosexuality, a significant share (31%) believes that homosexuality should be discouraged. Much of this resistance is rooted in deeply held religious attitudes, such as the belief that engaging in homosexual behavior is a sin. The public as a whole is evenly divided over whether engaging in homosexual behavior is a sin: 45% say it is while an identical share say it is not. How many Sochi athletes are competing for a country that is not their birth nation?